Are you planning to start a professional, commercial or a branch office in the Dubai Mainland? There are a number of advantages DED is offering entrepreneurs, investors and companies wanting to start a business in Dubai, UAE. Starting a company in Dubai is easier than ever. The Department of Economic Development or DED aims to help business owners launch and grow their businesses without going through a lengthy process. There are basically two jurisdictions in Dubai. The Dubai mainland and Free Zones. The mainland and free zones offer different set of advantages depending on your business activities and type of license. Option 3: Branch or Representative Office - A Branch office is a legal extension of the parent company and is permitted to secure contracts and conduct business activities, which are similar to those of its parents company subject to the approval of the UAE Ministry of Economy. Our team of multi lingual company registration experts look after our clients. Our team are experts in the UAE setup industry with over a decade of exeprience and have succesfully setup more than 5,000 companies since 2010. CREATIVE ZONE provides a wide range of business setup solutions to our clients. We provide professional and and cost effective comprehensive business services to manage all of your incorporation requirements. From activity approval to issuance of your trade license and your visas. 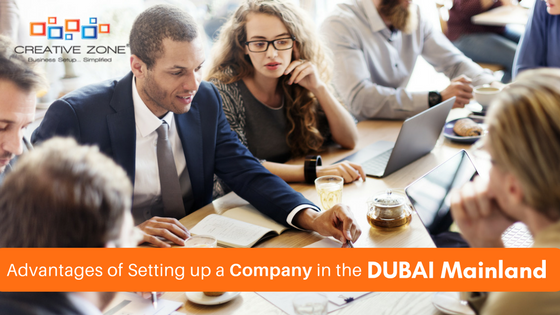 To learn more about how to setup a DED company in Dubai, contact CREATIVE ZONE's business setup advisors today. Get professionally guided every step of the setup process. Call us at 04 567 7333 or click the link below to request a call back.